The catalyst for this post was a recent comment from blogger and reader Serket. He is confused by exactly what DWSUWF means by divided government, why we support divided government and why we advocate voting for divided government as a voting heuristic. It also speaks to an observation by C Stanley commenting at the MVDG Gazette. As bloggers and pundits take note of the dire straits facing Republicans in 2008, the notion of voting Republican for President to maintain divided government is an emerging meme. This is nothing new to DWSUWF readers. In the end analysis, the real questions are these: What do you expect to accomplish by casting a vote and/or offering your political support? Do you vote for a party? for power? for personalities? for ideology? or for political objectives? This reference post, one of several, is intended to address these questions, and serve as a resource for future posts and comments. The DWSUWF answer. I no longer vote for a specific political party. Nor do I cast my vote based on a candidate's personality, or perception of who is the "best man" or what a candidate promises in a campaign. I vote for objectives about how our government should act. Objectives that are derived from a set of philosophical beliefs about how we choose to be governed. Objectives informed by the word and intent of our Constitution and Declaration of Independence. Federal government should be limited in scope, provide for common defense, protect and respect individual rights, spend and tax in a fiscally responsible manner, provide effective oversight of elected and appointed representatives, legislate carefully and slowly, and pass only laws that are tempered in the fire of partisan debate. I vote in the hope and expectation of moving our government and country toward these objectives. Many would recognize these objectives as a centrist, moderate and/or small "l" libertarian perspective. While political parties and candidates pay lip service to these goals and objectives, there is no empirical evidence that these objectives can be accomplished by voting for a specific party or candidate. Neither Republicans or Democrats can be relied on to move our government toward these objectives. Voting for a 3rd party like the Libertarians also does nothing to move the country toward these objectives. Yet, there is a way to vote that has been historically documented to accomplish exactly these goals. Let me repeat that. If you want to vote for those objectives, there is a way to vote that has been shown as documented historical fact, to deliver exactly what you are voting for, 100% of the time. These objectives can be accomplished at the ballot box. Not by voting exclusively Republican, Democratic or 3rd party, but by voting consistently for divided government. This historical research and analysis by scholars and economists show a cause and effect relationship exists between divided government and these objectives, based on a specific definition of Divided Government: one party controls the White House and another party controls one or both houses of Congress. Obviously, advocating a voting strategy based on that research will have no validity or foundation if a different definition is used other than the definition on which the research is based. Both Republicans and Democrats will argue (depending on election) that their respective parties are so ideologically mixed, that they constitute a divided government, even if they have secured single party control of the federal government. This argument completely misses the point. It is an attempt to avoid the consequences of this rational argument by changing a politically inconvenient definition. If one would like to see these objectives advanced, based on this scholarship, then one must use the same definition of divided government on which the scholarship is based. If there is any research showing the consequences on spending growth, and federal governance when we have a divided government defined as a mixed cabinet, or an ideologically split single party, then there is something to talk about. I am unaware of any such research. Until I see it, I'll stick with this definition. 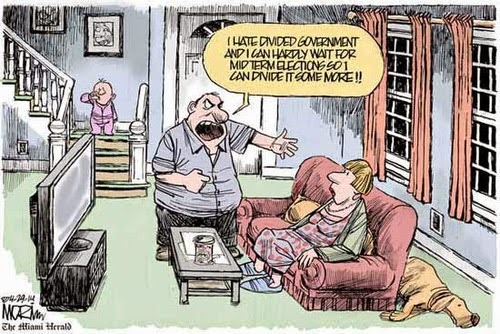 What does it mean to vote for divided government? First, voting for divided government works. It actually does. I voted a straight Democratic ticket in 2006 to elect divided government, and I got exactly what I voted for. The result of the 2006 election is playing out before our eyes. Next, there is only a divided government vote, if that vote is obvious. The divided government vote was obvious in 2006 and it is obvious in 2008. The Democrats will not lose the House or Senate in 2008. There are 33 Senate seats contested in 2008. Of these, 21 are held by Republicans and 12 by Democrats. Simple numbers lead to a simple conclusion - the Republicans have more at risk, and the Democrats have many more opportunities to take seats than Republicans. This is a crushing structural advantage for Democrats. The Senate is out of reach, but what about the House? The House of Representatives has never changed majorities in the 100 years since we have been directly electing Senators, unless the Senate also changed majorities. The conclusion is clear. In 2009 we will again have a Democratic House and Senate. The most recent polls confirm this political liklihood. The benefits of divided government can only be maintained by electing a Republican or independent 3rd party President in 2008. What if there is no obvious "divided government" vote? If the "divided government vote" is not obvious, if reasonable people can argue about what the correct "divided government" vote should be, then there simply is no "divided government" vote for that election. In that circumstance, the moderate/libertarian divided government voting block would go "free agent." There are other situations where it will be as completely obvious that there is absolutely no divided government vote. For example: The Democrats structural advantage in the Senate race in '08 will flip to an advantage for the Republicans in 2010. There is a reasonable probability that they can retake the Senate then. Should that happen and the Democrats hold the House of Representatives, we will go to 2012 with a divided Congress. This means the presidential vote in 2012 will have no divided government preference (assuming that historical incumbent advantages hold.) It simply does not matter which party the president belongs to, as the congress and the government will still be divided. The moderate/libertarian vote again become "free agent." Will the "Divided Government vote" always work? Divided government works now. 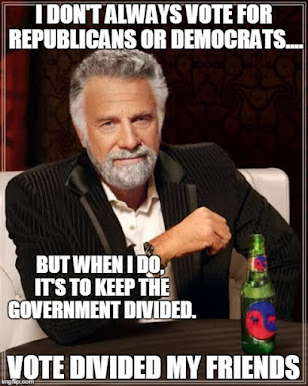 When there is an obvious divided government vote (as in '06 and '08), voting for divided government is the best way to accomplish the objectives outlined in this post. It may not alway be that way, and accomplishing these objectives may not always require a divided government vote. After all, it is the objectives and not the divided government state that matters. One could speculate that if this meme were to evolve into a tightly organized and highly sophisticated voting block, it could become very granular and work to maintain a divided congress at all times, so the presidential vote would always be "free-agent," "best-man," lesser-of-two-evils," most libertarian, whatever. But that is getting pretty far-fetched, even for DWSUWF. Ultimately, I see this voting tactic as highly effective, but short-term and self-limiting. 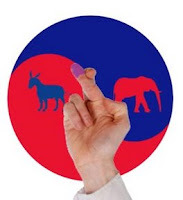 Maintaining divided government has real benefits in terms of governance, and the primary benefit of successfully implementing this voting tactic is to move the country toward the objectives outlined in this post. As a side benefit, it could serve to establish the moderate libertarian center as a self-aware, broadly recognized and organized voting block. Objectively, divided government only slows the growth of the state, with no evidence that it can actually begin to reduce it. One way to describe the situation is that the "Divided Government vote" stands down when the "Moderate/Centrist/Libertarian vote" stands up. Ultimately, if the divided government constituency is co-opted and eroded because Democrats and/or Republicans are wrestling with each other to prove who are the better, more effective moderate/libertarians, and can prove this to a skeptical, rational, empirical moderate/libertarian swing vote ... well then our job here is done. Imagine there is a candidate and party running for federal elected office, and you were informed by a time traveler from the future that voting for this candidate would absolutely move the federal government toward the objectives you seek. Would you vote for that candidate? The name of the candidate is Divided Government. Divided Government was elected in 2006. Divided Government has moved our country toward the objectives we seek. Reelect Divided Government in 2008. UPDATED: October 6, 2007 - Fixed typos and links, minor edits. UPDATED: October 9, 2007 - Tracking links, cross-posts, and reaction wrap-up. "This seems quite logical to me. In a way, this is the only way to achieve in America what’s achieved in, say, the Netherlands constantly. Here, not one party is able to win the majority of the seats in Parliament. Our government is always formed by a coalition of two, often three parties. Because of this, the parties that form the coalition have to compromise. In other words, not one of the parties involved can push through its entire agenda, and - as a result - damage done is usually limited." "I’ve written several times previously that if the American political landscape must be dominated by a duopoly of Democrats and Republicans, I’m happiest with the government when neither party has a monopoly in Washington." Finally this post was linked by Pat Santy at Dr. Sanity's Carnival of the Insanities and The New Pundit's Carnival of Political Punditry. Gary Gagliardi also linked the post and brings a truly unique perspective applying the lessons of Sun Tzu to the divided government meme at The Warrior Class Blog in his brief post Divide Your Enemy. This last link strikes me as a bit of "If all you have is a hammer, everything looks like a nail", but hey - I appreciate the link and the comments. Net net. The primary arguments in opposition to divided government are revolving around the notion of "nothing gets done", which - of course - completely misses the point. Scholarship referenced in this post shows that major changes that occur under single party control is often undone under subsequent administrations, while major changes that occur under divided government tend to last. Another unsurprising reaction is that divided government support that was "partisan on the left" in '06, is now "partisan on the right" in '08. Hmmm - sounds like a metaphorical " Won't Get Fooled Again" by The Who is in the offing for a future post.